alaTest ha raccolto ed analizzato 33 recensioni su Yamaha RX Z9. La media della valutazione per questo prodotto è 4.4/5, confrontata con la media della valutazione di 4.7/5 per altri prodotti. Abbiamo analizzato differenti valutazioni di esperti ed utenti, età del prodotto ed altri elementi. A confronto con altri prodotti, Yamaha RX Z9 ha ottenuto un alaScore™ complessivo di 77/100 = qualità Buono. 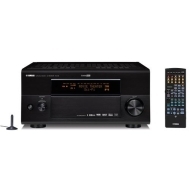 Review: The Yamaha RX-Z9 AV Receiver is an exceptionally good product and value. It dominates a segment of the marketplace currently not filled with every conceivable feature. High end audio meets AV. The best Yamaha AV receiver ever... awe-inspiring design, terrific build quality, astounding performance and expensive. One-off product. Solide grunty power out put with plenty of inputs and controls. When i listen the pure direct doesn't have enough bass, but everything else associated with the sound is great. At times it gets too hot. It's pretty good. The best I have owned. Maybe the best thing out there before breaking the receiver functions into components.